Fiat has injected some fresh funk into the Tipo range with a new trim level designed to bring style at ‘an accessible pricepoint’. ‘Street’ trim sits in the lower half of the hatchback’s line-up, just above ‘Easy’ grade. To distinguish it from the rest of the model range, this new option boasts 16-inch black alloy wheels, tinted rear windows and black styling highlights on the mirror covers, front grille and door handles. As for luxury features, the Tipo Street isn’t laden with tech in an effort to keep costs down, but it does boast LED daytime running lights, electrically adjustable door mirrors, cruise controls and a DAB radio system with Bluetooth support. Those looking for a little more can specify heated seats, parking sensors and a range of optional paint choices. Just one engine is available for the Tipo Street — a 1.4-litre naturally-aspirated petrol unit developing 94bhp and 127Nm of torque. Power is sent to the front wheels via a six-speed manual gearbox, resulting in a 0-60mph time of 11.9 seconds with a 115mph top speed possible. As for efficiency, Fiat claims it can return 37.2mpg while emitting 149g/km of CO2. 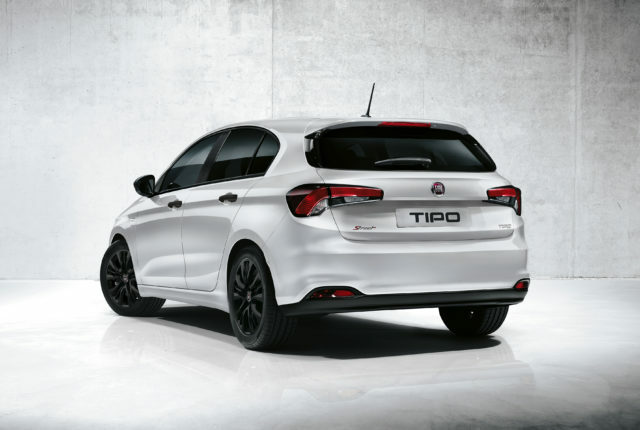 The Fiat Tipo has been on sale in its current guise since 2015, slotting above the Punto supermini which has since been taken off sale after 13 years on the market in its final generation. Available to order now, the Fiat Tipo Street starts at £15,050 — with deliveries to follow imminently.